There are valid, scientific reasons for the term “Eat the Rainbow!” Increasing the number of fruits and vegetables in your diet is important for improving overall quality of life and enhancing the body’s ability to fight of diseases. It’s important to eat a wide variety of fruits and vegetables, especially of different colors. Plants contain what are called phytonutrients (meaning: plant nutrients), that protect human cells from damage that ultimately results in diseases, such as cancer and heart disease. The phytonutrients are what gives the fruits and vegetables their vibrant colors. Take an red tomato for example, it contains lycopene a kind of antioxidant that is common in red colored fruits and vegetables. Lycopene may help protect against prostate cancer. Purple sweet potatoes and blueberries contain a phytonutrient called anthocyanin, which is beneficial for the brain and may even be helpful for lowering blood pressure. 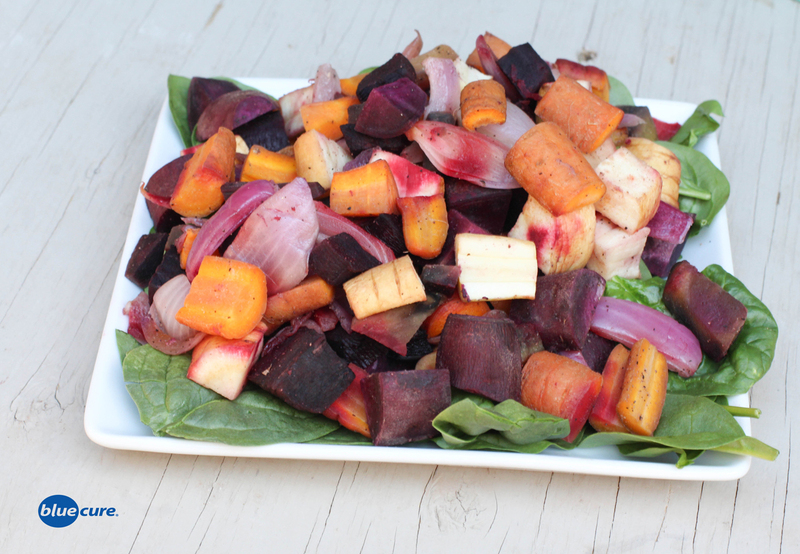 These rainbow root veggies are a great way to include a variety of different colored veggies in your meals. They are really pretty too and taste great! Pair the roasted root veggies with your favorite veggie burger recipe, grilled portobello sandwiches, or make the veggies the starring role by tossing them in greens and adding in some beans to make a roasted rainbow veggie salad. Preheat the oven to 400F. Wash all the veggies. Chop the veggies to be about 2 inches thick. Place the veggies on baking sheets with edges. If using red beets, you may want to place these separate from the other veggies as their color tends to bleed and turn everything pink. In a bowl, mix together the veggie broth, garlic powder, and pepper. Pour the veggie broth mixture over the veggies and mix the veggie to help coat them in the broth. Roast the veggies for 40-60 minutes, or until desired texture. Avoid burning. Serve the veggies with avocado slices or even homemade cashew cream. Enjoy!